I had no idea what a Mixel was supposed to be when I first saw them on the shelf at Wal-Mart, but they fit my criteria for instant purchase: they were labeled "LEGO" and priced under $5.00. That's a small price to pay for love. What are Mixels? For one, they're the star of a very silly series of flash animations airing on Cartoon Network. They're cute, but obviously aimed at younger crowd less likely to break their neck trying to figure out what the hell is going on. They are also the stars ofCalling All Mixels, a rather lovely (if a bit simple) real-time strategy game for iOS developed by Cartoon Network. It's quite a charming little game, and it's not free-to-play ($3.99), so you don't need to be frightened of it. Mixels is LEGO's stab at a transmedia brand, a property created specifically with a wide variety of entertainment markets — toys, television, video games. Take a handful of endearingly stupid-looking critters, imbue them with personality, and send them off into the world to make money. So far they've made $40 off of me, purchasing each of the nine characters in the first wave of toys. 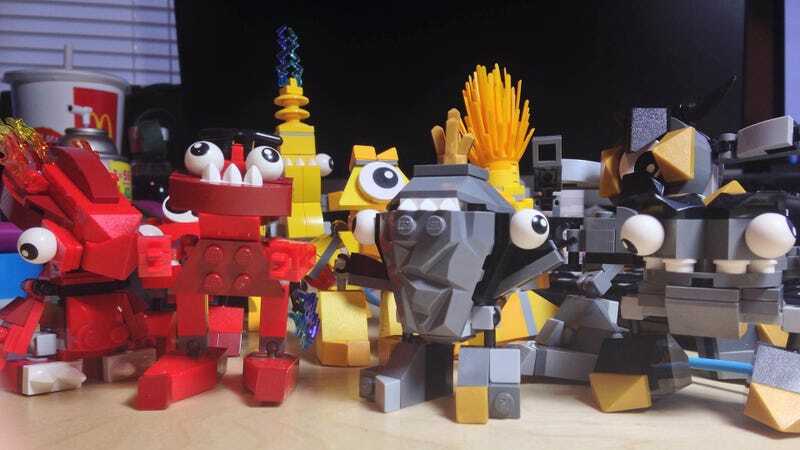 The Mixels are divided into elemental tribes, united againts the Nixels, creepy little LEGO nihilists. LEGO plans three waves of Mixels build-a-buddies, each featuring three different elemental tribes. The first wave consists of the rock-like Cragsters, fiery Infernites and the obvious Electroids. Each tribe has three members, which can be combined into one larger, more powerful gestalt. The Cragsters are my least favorite of the bunch. I love Seismo's long legs and single recessed eye, and there's a certain stupid charm to the crown-wearing Shuff, but Krader, with his oversized left hand and strange, angular composition just makes me feel uncomfortable. The Mixel's character begins to kick into high gear with the electrically-charged Electroids. One-eyed Teslo oozes personality. The living lightning rod Zaptor makes his horrific underbite work for him. My favorite is Volectro, he of the spiky hair and individual fingers, master of the classy raised-pinky look. The Infernites are the best of the best. Well, maybe not Zorch, with his handlebar head. And certainly not Flain, the number one source of extra LEGO transucent flame pieces. Nah, the Infernites rock because of Vulk. He's the guy on the left with the one eye, giving you sideways glances. Don't you just want to hug him? The Mixels get their name from the ability to mix characters together to form new ones. LEGO has instructions posted at the official website for those willing to break these guys into pieces. I'm in no rush to smash the band to bits and then put them back together into a much bigger band. As far as I am concerned, they are perfect as they are. There's more personality and play-ability in a single $5 Mixel character than in any $20 boxed LEGO set. Ball joints make some of the figures highly pose-able, and if the one you chose isn't, pick up another one. They're only a fiver, and each new figure compounds the entertainment value. It's kind of evil that way. I'm looking forward to the release of the second and third wave of characters later this year. At this point I'm all-in, and I don't mind at all. Mixels are the most fun I've had with pre-packed LEGO sets in ages.